At CES, Mushkin provided their usual roadmap update detailing the next several SSDs they plan to release. There aren't any big surprises: several of the products have been mentioned previously, and they all fit the general pattern of a vendor building off of Silicon Motion's reference designs. But for that same reason, Mushkin's plans also give us insight about what to expect from several other brands that are also reliable partners for Silicon Motion. Mushkin's flagship SSD for 2019 will be the Pilot-E M.2 NVMe, replacing the Pilot. This is a transition from the Silicon Motion SM2262 controller to the SM2262EN, a transition that ADATA and HP have already made or announced with the SX8200 Pro and EX950 respectively. We previewed the SM2262EN controller last year and will have our first review of a final retail product up later this month. Last year's SM2262 drives were the clear winners of the high-end SSD product segment, with performance that generally rivaled top drives like the Samsung 970 EVO, but with prices low enough to ruin most attempts to introduce a separate entry-level NVMe product segment. The Pilot-E will still be using the same Micron 64-layer 3D TLC NAND as the original Pilot, so all the performance improvements will be a result of controller and firmware changes. The Mushkin Helix-L was announced last year but never actually hit the market. The specs are unchanged: it's a low-end NVMe SSD with the DRAMless Silicon Motion SM2263XT controller that uses the NVMe Host Memory Buffer feature. Silicon Motion's low-end NVMe controllers are somewhat unusual in still having four PCIe lanes instead of just two, but peak sequential access performance still isn't expected to break 2GB/s. 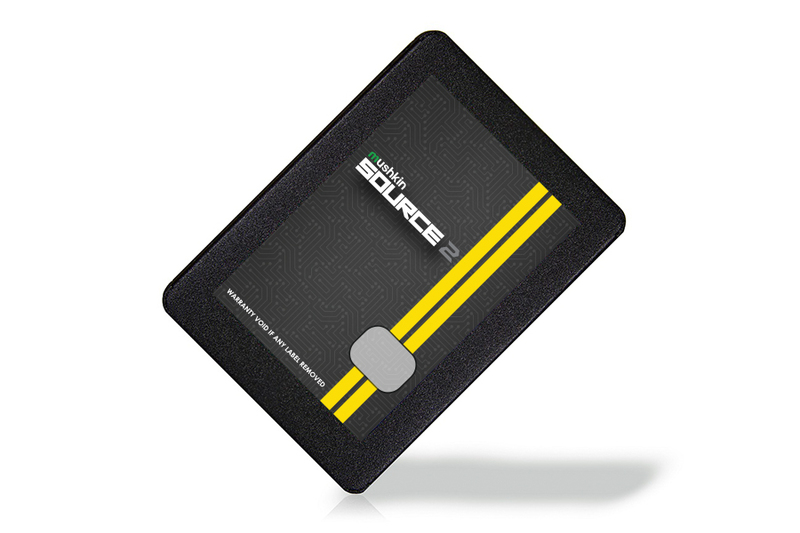 The most interesting drive is the new entry-level Source 2 SATA SSD. We found the Mushkin Source to be a decent DRAMless SATA SSD (subject to the usual performance caveats for this product segment), and it has generally been very well priced. The Source 2 will update to Micron's 96-layer 3D TLC and the Silicon Motion SM2259XT controller. The NAND flash upgrade was sure to appear somewhere on this year's roadmaps, but Mushkin is planning to start shipping it in the second quarter of 2019, which is a little sooner than we were expecting. Toshiba kicked off the 96-layer transition last year with the XG6 but has made no move to introduce 96L flash to the retail SSD market, and the best we've heard from their partners is to expect products in the second half of 2019. Samsung announced their 96L transition plan including a 970 EVO Plus, but didn't give a detailed timeline. Intel and Micron have been pretty quiet, but based on Mushkin's plans it looks like many Micron-based drives will probably switch to 96L NAND before their Toshiba-based competitors. The switch to the SM2259XT controller is a bit unexpected. The only drive we've encountered with the SM2259 is the Intel 545s, and we haven't run across anything else with the DRAMless -XT variant. Most vendors seem to view the SM2259(XT) as offering few advantages over the SM2258(XT), since the upgraded error correction and end to end data path protection it offers are not seen as strictly necessary for consumer drives and are more about increasing the controller's appeal for datacenter applications. Mushkin's decision to move to the SM2259XT for a low-cost drive like the Source 2 indicates that it doesn't cost any more than the SM2258XT.